Becoming a member of HMAF makes you a part of a world-wide organization devoted to the study and growth of Hakko Densho Ryu Jujutsu and to ensuring that the deep original roots of this art are not lost. Both individuals and groups will benefit from joining the Hakko Densho Ryu Martial Arts Federation by becoming involved in a network of dedicated martial artists interested in studying and promoting this art. For individuals, annual membership is $30. It provides you with a membership card, documentation of rank requirements and techniques, eligibility for rank promotion, quarterly HMAF newsletter, and an opportunity to attend all HMAF-sponsored events at a discount. Click here to open a window for a new basic annual membership (or renewal). Our Affiliated Membership is $50 per year. This membership is for dojos or martial arts schools whose head instructor desires to be more closely tied to HMAF. The head instructor and a minimum of 20% of your actively training students must maintain annual membership status to receive this Membership. Benefits include a Certificate suitable for framing, and group rates at HMAF-sponsored events. 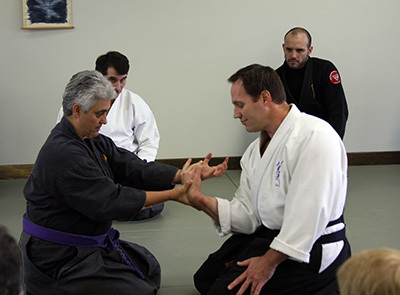 There is no requirement for maintaining any specific martial arts curriculum. If desired, assistance in the development of a Hakko Densho Ryu Jujutsu curriculum is available. Click here to open a new window for Affiliate registration. 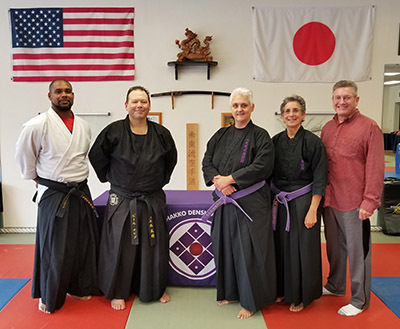 Whether you are joining as an individual or as a group, there is no requirement of prior Hakkoryu Jujutsu or Hakko Densho Ryu Jujutsu experience or rank, and no requirement that you pursue rank.